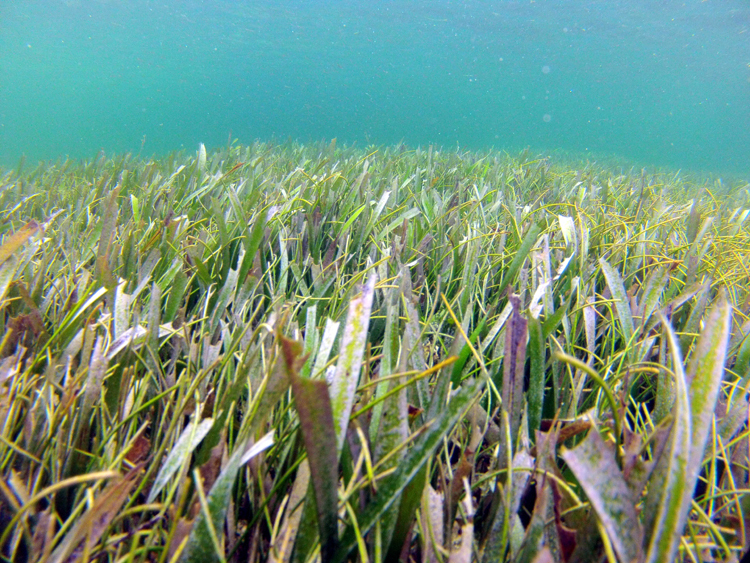 Seagrasses are an important store of ‘blue carbon’ (Image credit Blue Climate Solutions). Grasses growing at the bottom of our oceans lock away large quantities of ‘blue carbon’, according to a new study. The results suggest that the soil that seagrass grows on is capable of storing more carbon than soils on land and as a result of the current global decline in seagrass, vast stores of carbon may be being released into the ocean and atmosphere. Seagrass is widely distributed in the world’s oceans, including in Europe, but is declining rapidly; the global loss rate of its extent has averaged 1.5% a year since the beginning of the twentieth century and accelerated in recent decades. In the EU, the Natura 2000 network and the Nitrates, Urban Wastewater, Water Framework, Marine Strategy, Birds and Habitats Directives offer direct or indirect protection to seagrasses. Around a quarter of the Mediterranean’s seabed, at depths between 1-40 metres, is covered in seagrass. However, disease, pollution, eutrophication and disturbances, such as dredging and construction of dams, harbours and pipelines, all pose threats to seagrass. Seagrasses are an important store of ‘blue carbon’, the carbon stored by marine life, and may release an amount of carbon that is equivalent to 10% of that released by land use changes, according to the study. To reach this figure, the researchers analysed a database containing 3640 observations of 946 seagrass meadows around the world to try to understand how much carbon is locked away in seagrass plants and soils. They estimated that around 3 tonnes of carbon are stored in living seagrass per hectare covered. For soils, organic carbon stocks had been measured down to the depth of a full metre, but in some, estimates were only available for shallower depths. The researchers combined data from the metre-deep measurements with their own estimates, based on extrapolation, for the remaining sites. Their conservative calculations suggest that an average of 140 tonnes of organic carbon are stored in the top metre of each hectare of seagrass soil, which is around twice that found in soils on land. The researchers went on to estimate the total amount of carbon sequestered by seagrass globally. Assuming that seagrass meadows cover between 30-60 million hectares (around 0.2% of the area of the world’s oceans) they estimate that a total of between 4.2 to 8.4 petagrams of organic carbon (where one petagram is equal to a thousand million tonnes) is stored in the top metre of seagrass soils. A less conservative estimate suggests the figure could be as high as 19.8 petagrams. Terrestrial soils, by comparison, cover 15 billion hectares and are estimated to contain between 1500-2000 petagrams of organic carbon. A further 75.5 to 151 teragrams of carbon was estimated to be stored in seagrass itself (where one teragram is equal to one million tonnes). Mediterranean meadows held the largest stores of organic carbon yet identified, although data for the Pacific and South Atlantic are currently limited. In the Mediterranean, seagrass soils containing 11-metre thick organic carbon deposits that have built up over thousands of years have been found. Elsewhere, carbon stores also go deeper, but the researchers focused on the top metre as it is the most easily returned to the atmosphere when seagrass meadows are lost. Journal article: Fourqurean, J. W., Duarte, C.M. Kennedy, H. et al. (2012). Seagrass ecosystems as a globally significant carbon stock. Nature Geoscience. 5(7): 505-509. DOI: 10.1038/ngeo1477.